Please note: Excerpt rewrote from Wikipedia, and photo took from Internet where I could not locate how to credit. Sensationalism is a type of editorial bias in mass media. in which events and topics in news stories and pieces are over-hyped to present biased impressions on events which may cause a manipulation to a story's truth. Sensationalism may include reporting about generally insignificant matters and events that don't influence overall society and biased presentations of newsworthy topics in a trivial or tabloid manner contrary to the standards of professional journalism. Some tactics include being deliberately obtuse, appealing to emotions, being controversial, intentionally omitting facts and information, being loud and self-centred and acting to obtain attention. Trivial information and events are sometimes misrepresented and exaggerated as important or significant, and often includes stories about the actions of individuals and small groups of people, the content of which is often insignificant and irrelevant relative to the macro-level day-to-day events that occur globally. Furthermore, the content and subject matter typically does not affect the lives of the masses and does not affect society, and instead is broadcast and printed to attract viewers and readers. 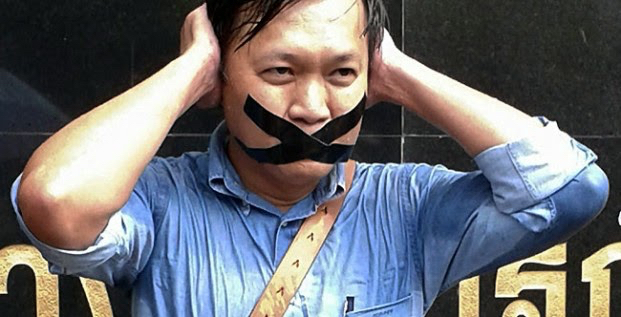 In Thailand, many examples of sensationalism, sensational journalism can be found easily. Many of media reporters, journalists are biased, took sides, and manipulated media to gain interests, for rather notorious benefit which I will not be bother to explain. And some, went as far as making soap opera in public, but again, I will not waste my time telling who they are. My readers should be able to figure out what I meant. Credit: Photo took from Internet where I could not locate how to credit. Owner of photo please kindly contact Mr. Veerapat Viboolsawaswatana, @LastIFound who gathered, processed and submitted information for me to rewrite this short piece, if there will be any copyright issue for using this piece of photo. Thank you to Mr. Viboolsawaswatana for everything.